Dr. Mark P. Leondires is the Founder, Medical Director and Partner in reproductive endocrinology at Reproductive Medicine Associates of Connecticut (RMACT) and Gay Parents To Be (GPTB). He is board-certified in both Obstetrics and Gynecology and Reproductive Endocrinology and Infertility. For Dr. Mark Leondires, medicine offers an opportunity to solve problems; each fertility patient presents a unique puzzle. This, combined with a wide range of interests and life events, is how Dr. Leondires came into reproductive endocrinology and infertility and to start his own fertility practice. From the beginning, as one of four children born to his Greek-immigrant parents, Dr. Leondires’s environment has infiltrated and shaped the person he would become. In his early years, Dr. Leondires was raised with a prideful interest of ancient history and architecture, rooted in Greek contributions. This eventually led to a dual major in history and biochemistry at Colby College in Waterville, Maine. While these subjects seem to be unrelated, they represent Dr. Leondires’s dual soul, a Greek philosophy that recognizes the complimenting differences within one person. His freshmen year of college was interrupted when Dr. Leondires’s father suffered a heart attack. Caring for his father inspired Dr. Leondires to become an emergency medical technician (EMT) and later to enroll in the premed collegian track. After his undergraduate years, Dr. Leondires went to Harvard University to study angiogenesis, the development of new blood vessel formation. This appealed to his desire to study complex science, and he continued as an EMT to work as an EMT. The latter met his needs to combine science and working with people. Eventually he went to medical school at University of Vermont in Burlington, VT, where he was able to combine his interests in science, helping people, and, of course, fixing things. Dr. Leonidres completed his residency in Obstetrics and Gynecology at Maine Medical Center in Portland, Maine, which was followed by a fellowship in Reproductive Endocrinology and Infertility at the National Institutes of Health in Bethesda, Maryland. As a resident Dr. Leondires experienced a range of specialties. Initially he was most interested in the pediatrics rotation, but in the last week he worked with reproductive endocrinologist and infertility specialist. To his surprise, this spoke to him and pointed him in his path to become a fertility specialist. After medical school, Dr. Leondires served as the Director of Assisted Reproductive Technologies at the Combined Federal Program for Reproductive Endocrinology. While under his direction, the ART Program was one of the most successful in the Washington DC area and in the top tenth percentile nationally. During this time he was an Assistant Professor at the Uniformed Services University of Health Sciences and clinical faculty for the Combined Fellowship in Reproductive Endocrinology. Another puzzle Dr. Leondires worked to solve is family building for the LGBTQ community. When he became a parent with his partner, he recognized the limited options available to the LGBT community, which led him to create and launch GayParentsToBe, an educational resource supporting gay and lesbian couples and individuals to make family building choices. While his academic and professional career has led Dr. Leondires to spend his time in labs, hospitals and medical offices, he has not abandoned his love for biology and the outdoors. Dr. Leondires spends much of his time at the beach, teaching his two young boys about the marine life of the Long Island Sound. He loves being outdoors hiking, biking and skiing. 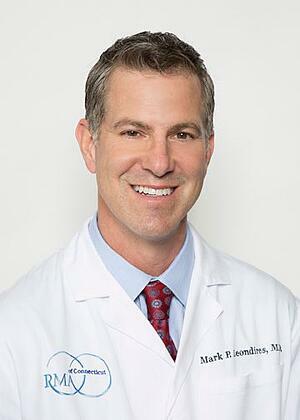 Dr. Leondires is a dedicated father to his two sons and his husband, whom he married in 2009. Contact us to book an appointment with RMACT lead infertility specialist Dr. Leondires in our Connecticut or New York fertility centers.